product. Use this handy ink guide to help you make the correct ink selection. • Black ink, as you might expect, is the most common and least expensive ink. • Process colors are reproduced by printing overlapping dots of cyan, magenta, yellow, and black (CMYK) inks. To create blue, for example, you combine cyan dots and magenta dots. Your eyes merge the cyan and magenta dots to perceive the color blue. Process printing gives us the ability to simulate photographic images using just four basic ink colors. often add an extra sparkle or touch of class to your printing project. • You want to print varnishes or special inks, such as metallic spot inks. inks costs less than printing with three or more spot inks. be reproduced with process colors. 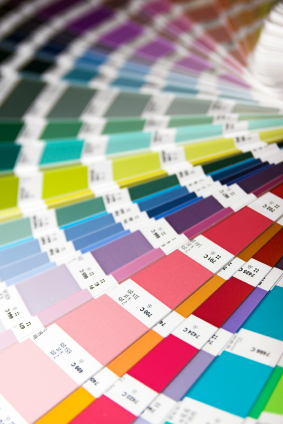 We are here to help you determine the right ink colors for your project. Just ask!